Yosemite is a magical place for all people... and their best friends! 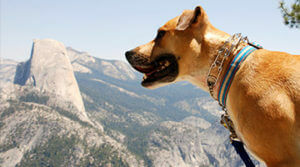 There are many great trails to explore in Yosemite with your dog and only a few important rules to remember for your pets safety and the safety of Yosemite's precious wildlife. Traveling to Yosemite with your dog can be a rewarding experience for you both but it does require you to plan ahead carefully to make sure you have selected pet-friendly lodging and activities. First off, where are pets allowed in Yosemite? They are allowed in developed areas where there are fully paved roads/sidewalks/bicycle paths and in all campgrounds (except walk-in campgrounds such as Camp 4) and in group campsites. However, you must keep them on a leash not more than six feet long or otherwise physically restrained (eg. kennel). Never leave them unattended and you must clean up after them. Also, other wildlife love pet chow too, so make sure you store it in a bear proof locker if you are camping. Pets aren’t allowed on shuttles, in lodging areas, in public buildings, in any wilderness areas, in unplowed snow, or on many trails (with some exceptions as noted above). To find pet-friendly lodging, go to our Lodging page and check the pet-friendly search filter. Dog kennels are available in Yosemite Valley at the stables (open seasonally) from 7:30 a.m. to 5 p.m. daily. Dogs must be gentle, over 10 pounds, with proof of shots and license required. The kennels phone number is (209) 372-8326.